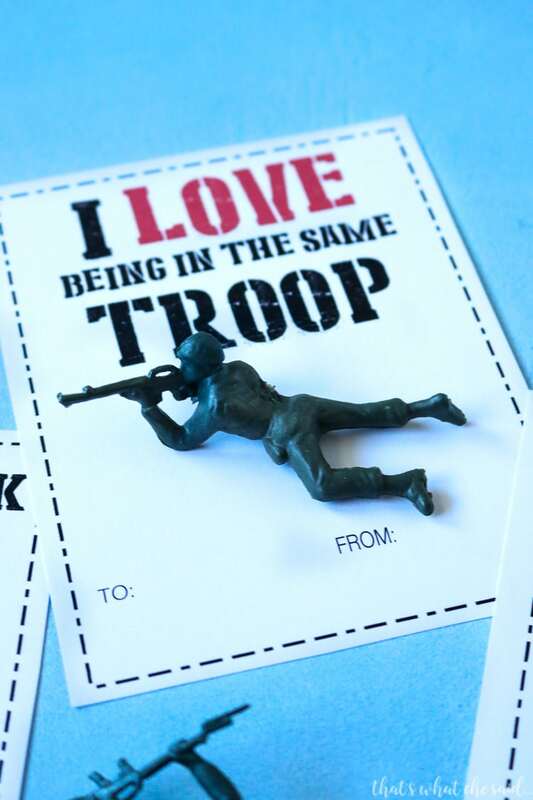 The perfect boy valentine idea for the little men in your life! 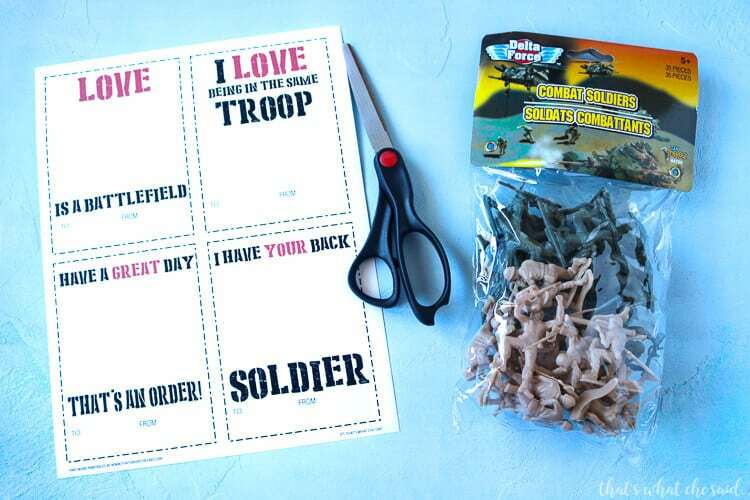 These Army Men Valentine Cards are easy to assemble and inexpensive to make with my downloadable valentine printable! 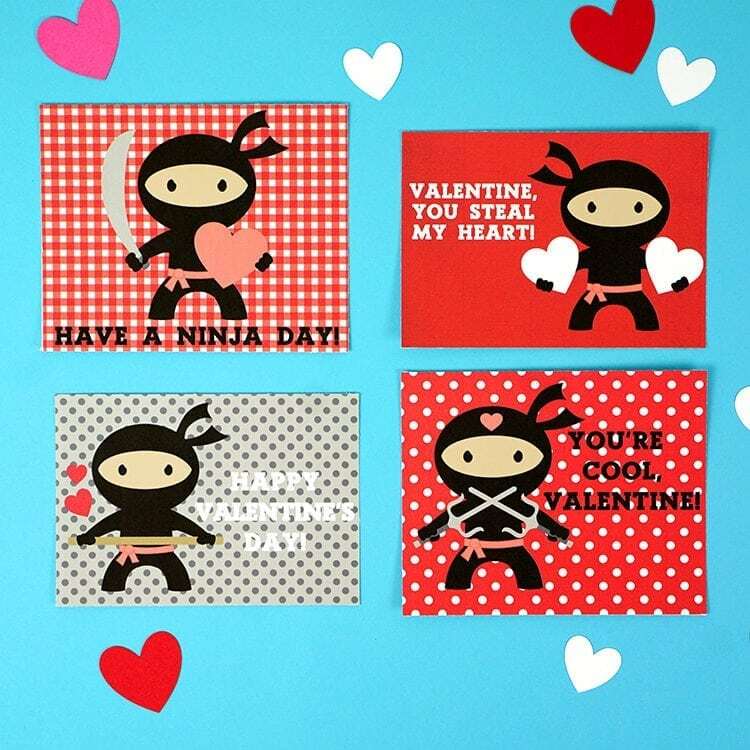 It’s also a great non-candy option if your school nixed the candy valentines! Valentine’s day can be tough for boy moms who have that kind of in-between age. My kids want to participate in the fun but not exactly are all hearts and roses, lol! 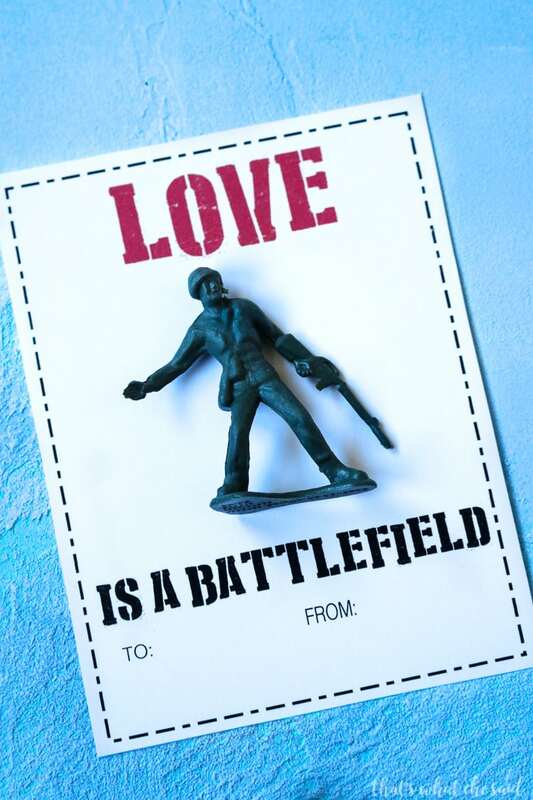 This Army Men Valentine Printable Valentine Card is perfect! My boys love to hand these “boy valentines” out! You can make these really inexpensively as well! I picked up a bag of army men at my local dollar tree. 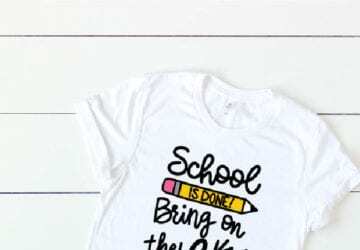 Then you print off these printables I made and you just need some tape or glue to attach and a pen to sign their name and you are good to go! So much cuter than the box versions! I use the HP Envy 5540 Wireless All-In-One Printer and signed up for HP Instant Ink. I highly recommend this! Never run out of ink at 11 pm when you have to print out your kids report, or when you have to print these valentines out the night before your child’s class party…because let’s face it…#procrastinatorsunite. I print the valentine’s out on white cardstock. I kept the design pretty simple with rectangles so that your little helpers could cut them easily. 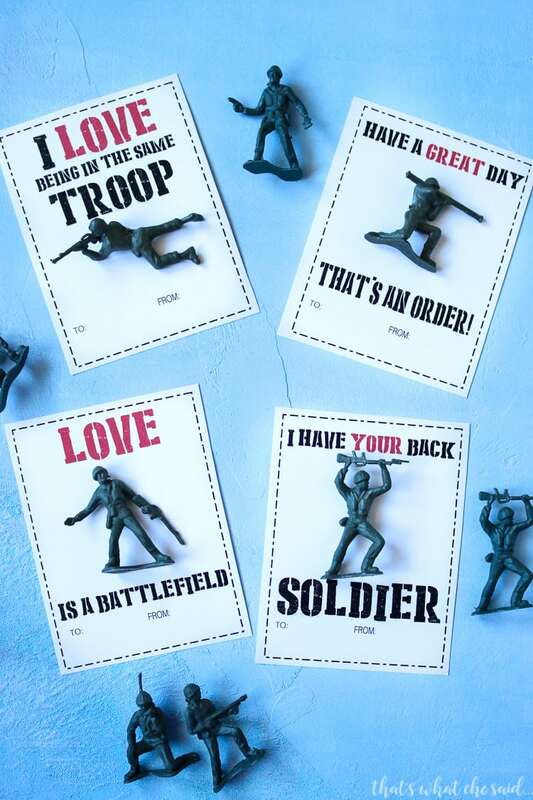 Cut apart and attach an army man to each card and have your child sign them. If you are using hot glue, make sure an adult does that! 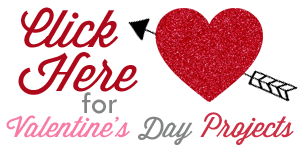 Click below to find more Valentine Goodness! 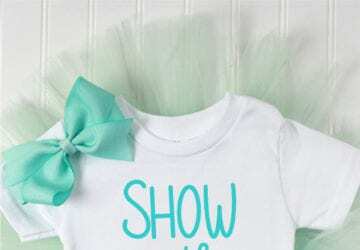 More Printables, Sweet Treats, Home Decor and More! How cute is this! I always thought Valentine’s Day didn’t have enough cute boy things, ya know, all flowers and roses and hearts. 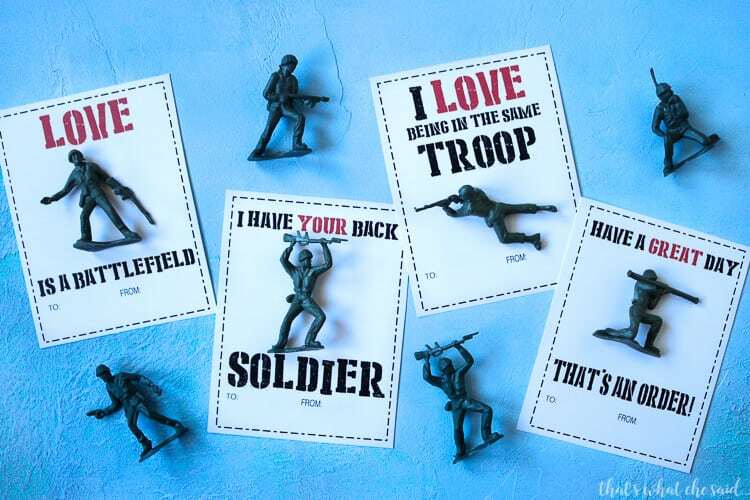 This is such a cute way for them to enjoy passing out valentines without feeling awkward. Good post! I’ve been looking at all of the other punny cards and printables you have and I LOVE them. I keep talking about them at work, and the girl next to me is sick of it! You’re a PUN MASTER! This is the perfect idea for my son…but when I go to download, it asks for a password??? 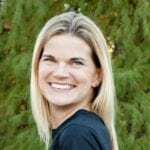 Leslie, if you are not a current member you can enter your name and email address. If you are a current member you can use the password which is at the bottom of all emails I send as well as the welcome email! Thanks!